let the beauty of the plant affect you – s.h.b. 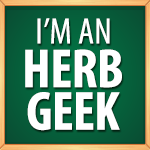 Two herbs are better than one? All photos, drawings and experimental writings are copyright (c) Herbaloo 2009-2014 unless otherwise stated.